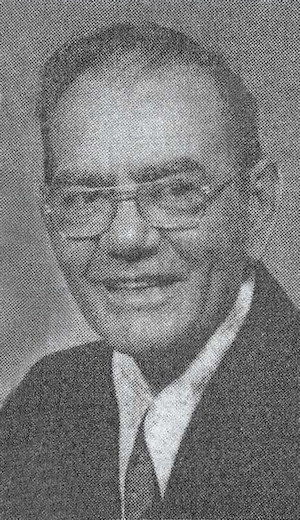 Obituary – Kime, Clyde W. « Perry High School Alumni Association, Inc.
Obituary – Kime, Clyde W.
Clyde W. ﻿Kime, the son of Charles E. and Lillie (Klinglesmith) Kime, was born at Macomb, Okla., Jan. 3, 1921. He came to Noble county with his family in 1923, attended Willow Creek school and was a 1942 graduate of Perry high school. In 1941, Kime was a member of the all-state football team. Kime served in the United States Air Force during World War II. He and the former Lois Ellis were married at Hayward, July 10, 1942. The Kimes lived in the Covington community where Kime was engaged in farming and was an oilfield worker from 1945-57. The Kimes moved to Perry in 1957. Kime was employed at Charles Machine Works from 1957 until 1973, when ill health forced his retirement. He was a member of the First Baptist church and the American Legion. In addition to Mrs. Kime, of the home, survivors include three sons, Larry, Terry and Kyle Kline, all of Perry; a daughter, Mrs. Herb (Sherry) Brand Jr., Perry; three brothers, Fred Kime, Perry; J. C. Kime, Davis; and C. L. Kime, Luther; one sister, Mrs. Beatrice Schinerling, Billings; and eight grandchildren. Kline was preceded in death by his parents, one son and one brother. Memorials may be donated to the Oklahoma Medical Research Foundation.